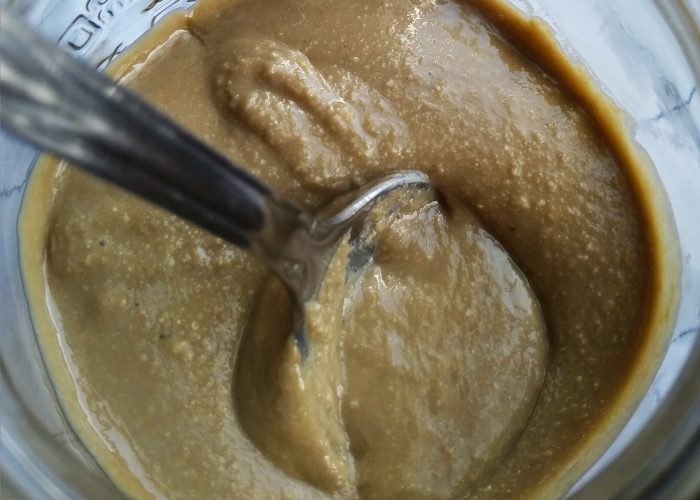 If you have never tried making your own homemade nut or seed butter, you should consider it. Why? Because let’s face it, store bought nut and seed butters tend to be quite expensive. Not only is it much cheaper to make your own homemade nut or seed butter, it is usually more fresh and flavorful too. Not only that, you can control the ingredients you put inside to make unique concoctions, as well as ensure no old or rancid nuts or seeds are used. All you basically need are nuts or seeds, some oil and a food processor or blender. To make your first try a guaranteed success, take a moment first to read my article Cooking 101: Must Know Tips When Making Home Nut/Seed Butters! See this super simple recipe below to learn how to make sunflower seed butter. It makes an energy dense, nutrient rich homemade butter with one serving (2 tablespoons) providing 6 grams of protein, 2 grams of fiber and 183 calories. Once you start making and eating this homemade butter, you will probably find you need to remake this at least once or twice a month (especially if the whole family starts to use it and you use it more in baking and other recipes). So I recommend making double the batch using a large blender or food processor. Then store half in a lidded glass mason jar or freezer safe container to bring out and use when the first jar is gone. Note that (obviously) this sunflower seed butter will have a sunflower seed taste. Even if you are not a big fan of sunflower seeds (my husband isn’t but my children and I love it), this still makes a great and inexpensive cooking and baking seed butter to have on hand at home. And in baked goods, you won’t notice the sunflower seed taste at all. That’s why I love using this sunflower seed butter in my home! A super quick and simple vegan, egg-free, dairy-free, nut-free homemade butter recipe using sunflower seeds. Put the roasted sunflower seeds, along with the half tablespoon of canola oil and half tablespoon of maple syrup into a food processor bowl or blender. Pulse for at least 30 seconds at a time, stopping to scrape down the sides of the bowl as needed using a rubber spatula, until a smooth creamy texture is attained. Once a super smooth creamy texture is reached, taste a bit of the sunflower seed butter to determine if you would like to add a little bit more sweetness to it. If so, add a little bit more maple syrup (agave nectar or honey) to the mixture and pulse for another 10 - 15 seconds. If the sunflower seed mixture is hot after you have finished blending, transfer the seed butter into a lidded glass mason jar and let it cool, before placing it into the refrigerator for storage. The finished homemade butter may look a little bit thin and watery. That is fine, as the sunflower seed butter will cool down and thicken up over time in the refrigerator. Generally, the longer you blend (stopping in between to prevent the food processor machine from getting overheated), the smoother and creamier the texture of the seed butter would become. However, if you are in a hurry or don’t mind having more oil in your concoction, you can add in half a tablespoon more canola oil and the mixture will blend up more quickly into a smooth texture. For a crunchier seed butter version, reserve a quarter cup of the sunflower seeds till the end and then quickly pulse it a few times with the rest of the butter mixture to leave some chunky seed bits inside. It is fine to buy raw unsalted sunflower seeds then just roast them yourself. To do so, preheat the oven or a toaster oven to 350 F (or 177 C). Then spread the measured amount of sunflower seeds onto a baking tray and place into the oven or toaster oven. Roast the seeds for 4-6 minutes on each side, until just turned golden brown in color (but not burnt). In my experience, toaster ovens tend to toast nuts and seeds more quickly so no matter which method you use (conventional oven or a toaster oven), watch the seeds and remove them before they become burnt! Let the roasted sunflower seeds cool for a few minutes before using. ← Fast Kitchen: Sharpen Knives! I would love to have some of this in my fridge!